This salad proves that salads aren’t just for summer. It is a perfect balance of the nuttiness of buckwheat, richness of avocado, sweetness of raisins, and tartness of vinegar. 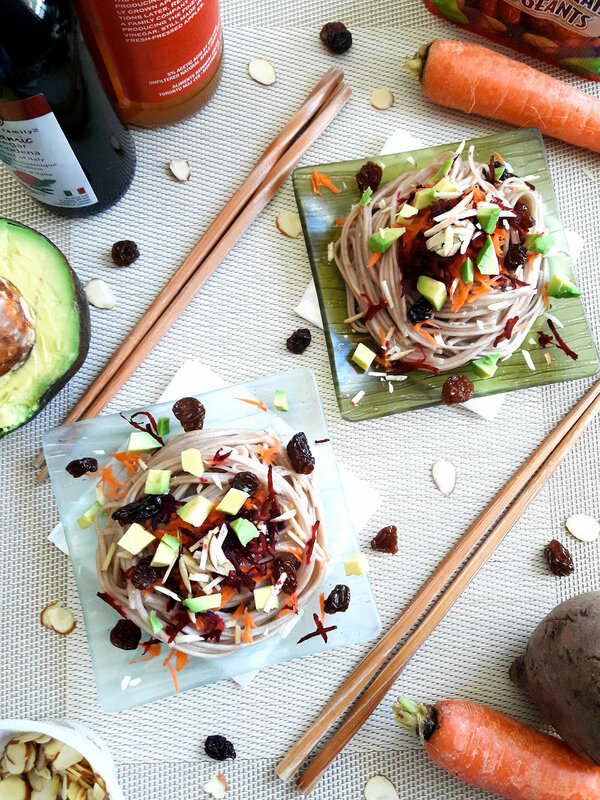 Buckwheat noodles are common in Japanese cuisine and can be found in Asian food shops and sometimes in the Asian food section of mainstream grocery stores. The noodles are usually tied into small bundles within the larger package. In a large pot of boiling water, cook noodles until they are al-dente. Drain and rinse with cool water. In the meantime, peel and grate the beet and carrot. Dice the avocado into bite-sized pieces. In a jar with a lid, combine the vinegars, olive oil, salt and pepper. Put the lid on the jar and shake to mix thoroughly. Divide noodles into 2 serving bowls. Top with vegetables, raisins and nuts. Note: If preparing the salad ahead of time, wait until just before eating to chop the avocado and add the dressing to the salad.